a few days ago i started a new project to turn leftover yarn from other projects into something soft and warm. the greige-colored yarn is the main color, i bought too much when making the bedspread for my mother. of the yellow and gray tones this is what i have and also a little off-white. more info about the yarn here. a while ago i read that crocheting into chains instead of into the chain-spaces gives a neater result. while making the blocks i wanted to try that when crocheting the outer rows and indeed i must admit it looks better. inserting my hook into a small chain was sometimes difficult – chains between other stitches always seem to be shrunk 😉 – but then i thought it would be easier with a slightly smaller hook. now i crochet the squares with crochet hooksize 5.0 mm and size 4.5 mm for the outer rows. if i start a new row with an other color, i use this method to prevent the beginning 3 chains. at the beginning of other rows, when i don’t change colors, i crochet 1 ch followed by the first dc, that makes the first group of 3 dc somewhat chubbier, but i think that is fine. this pattern for the squares i use with an extra row (5th row) of double crochets in the way i describe above with in the corners 1 dc into the first chain, 1 ch, 1 dc into the second chain. on the photo below the squares with the yellow tones lie a little close to each other, but i will make more uni-colored blocks with the greige yarn to put them in between for a calmer look. what do you think of a small blanket in only yellows and grays? i like to know! 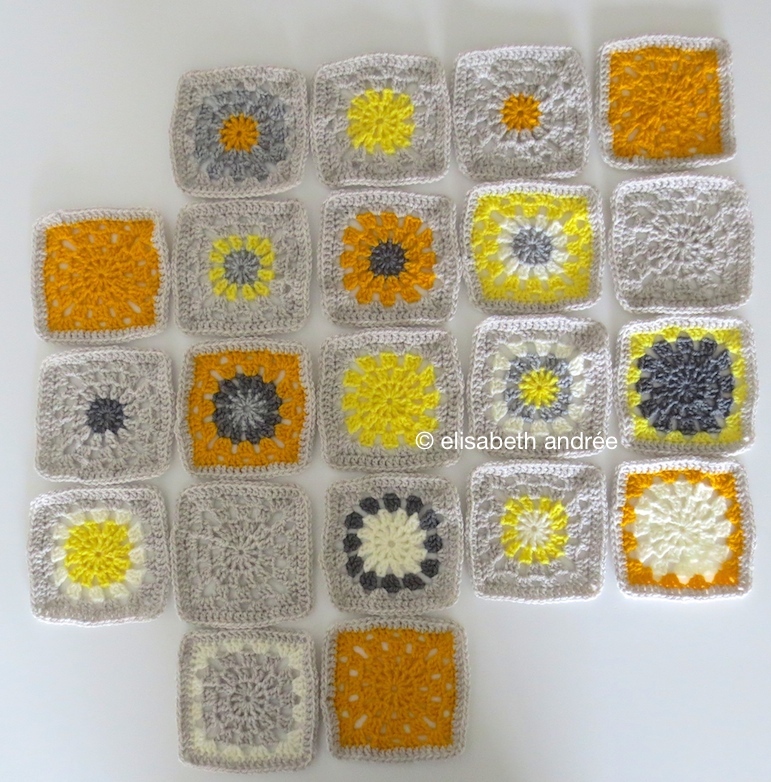 Categories: crochet, wip | Tags: blanket, crochet stitches, gray, square, squares, wip, yarn, yarn leftovers, yellow | Permalink. with a lot of short and longer pieces of leftover yarn i’ve made ​​yarn balls, crazy yarn balls, to make another cushion for a dog or cat (i think). the ball on the first picture i already had for a while. the pieces of yarn i knotted together, and normally that’s something i never do. the knots you can see and feel and they are not secure as weaving in yarn ends is. but i did it anyway because some pieces of yarn were so short and i did not feel for other methods to join the yarn ends. it’s a really fun project to work on because the nature of it is changing with every color you add. occasionally i crocheted a few rows of white yarn (also leftover from another project) between rows to freshen up the whole. at the moment i’m working on the edge with bright pink yarn of which i found an almost complete ball in a bag with leftovers. then i will sew a fabric cover to fill with more leftover yarn and yarn ends, to put in the crochet nutty pillow. but i have no time for that the coming days, so that’s a job for next week. Categories: crochet, wip | Tags: colors, crochet, cushion, pillow, wip, yarn, yarn ends, yarn leftovers | Permalink. then i thought, let me make a few more toys, and so it happened while i wrote down the pattern. at first, i was inspired by a diagram for a scrubber, this is the link to it. the toy is intended for a dog to play with, but depending on used materials and colors, it is suitable for multiple purposes. i have adjusted the pattern of the first toy just a little. maybe you want to crochet one or more toys, so here is the pattern. what you need is leftover cotton yarn, i used cotton 8 with crochet hook size 3.0 mm. for one toy, in total, i have not even used 1 ball of 50 grams. you also need a needle with a blunt point and acrylic yarn ends for the stuffing. i have the toys filled with acrylic yarn ends because i think acrylic attracts less ‘dirty creepies” and dries quickly after washing and just as important, it is light weighted comparing to cotton. finish off, weave in ends and then you make the other half of the toy in the same way. 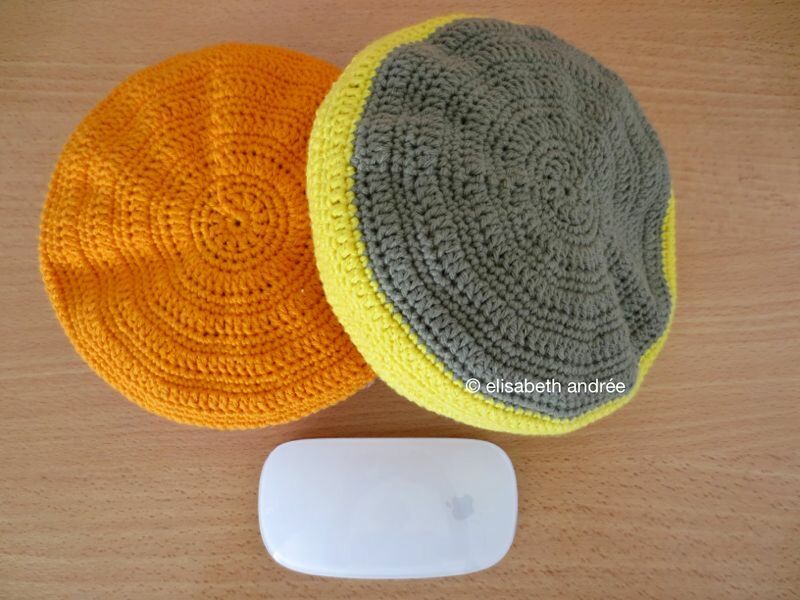 hold halves with right sides together and crochet them together with single crochets (see photo) but leave a part unworked large enough for turning and stuffing, cut yarn but leave the yarn end long enough to close the toy after stuffing. turn the right sides out and start filling but it is better not to put to much into the toy, that way it remains soft and easy to hold by a dog without getting cramps in the jaws. after filling, sew the last stitches by pulling needle and yarn under the same loops as you would with a crochet hook (see photo). weave in yarn ends and your toy is ready to play with. Categories: crochet, tutorial | Tags: crochet, cushion, dog, free pattern, toy, tutorial, yarn leftovers | Permalink. 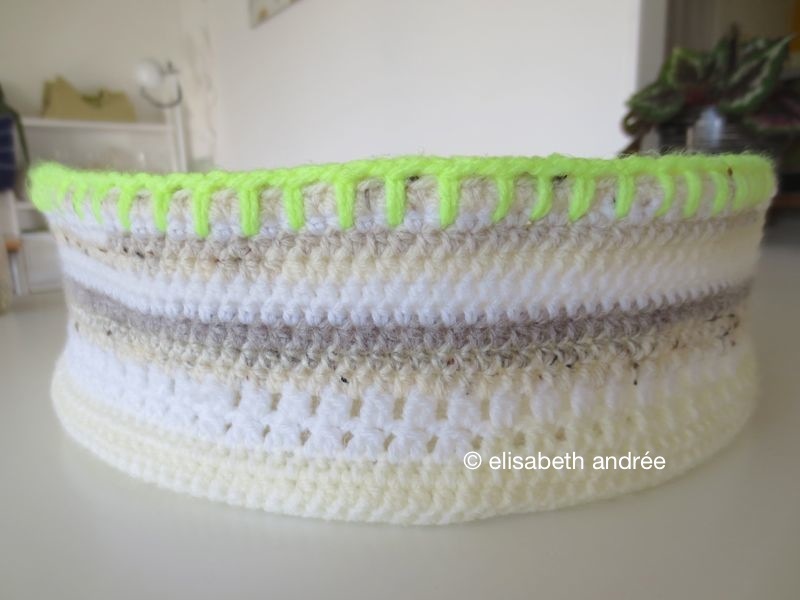 the snowball made of yarn leftovers is now a basket with a neon edge. sometimes i amaze myself with the fact that i forget to think. i had the basket when it was finished, washed and then i used fabric softener. it was nice and soft, including the side, which obviously remained lying flat. to solve this, i have a mixture made ​​of water-soluble glue/children’s glue and sugar water and applied it onto the basket. now the basket is firm enough to function as fruit bowl/basket and in december i can fill it with baubles. the material feels a bit like a straw basket. you can see the knots where i have tied the yarn ends. earlier this week, i admired the work of haafner and she asked whether or not you like variegated yarn. this is an ongoing subject on the ‘interwebs’ i have the impression and it seems a majority don’t love this kind of yarn. to my opinion variegated is nice as long as it is not ‘into your face’. 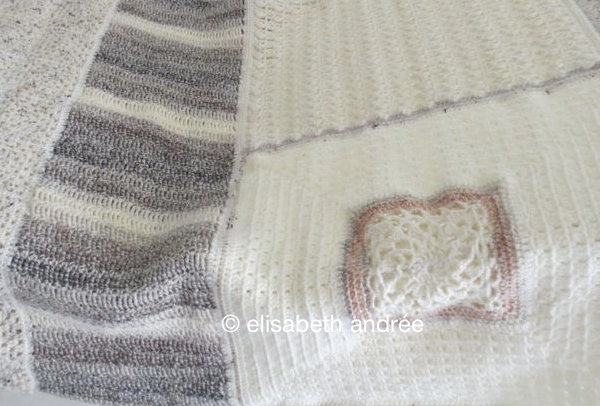 a part of the melange blanket (photo below) is a scarf that i made years ago and then i did nothing with it, because it is too much for me. but over the years i have learned to appreciate variegated yarn and have used it for projects regularly. for this pouf, for example, and for the small grannies i used variegated yarn but have the yarn cut into pieces and made small balls of it. that way i can keep control over the colors. sometimes variegated yarn consists of such soft tones they don’t really stand out like the yarn of this scarf. and if you work with multiple threads of different colors, you create your own variegated yarn as in this round rug. i like to combine variegated yarn with single colored yarn, i can well appreciate the effect of it. but sometimes things go a little wrong and then i am unable to imagine a project for the yarn i have. it was a small child who said to me that the yarn was beautiful and i thought then i like to make something for a little girl’s room. that became the storage bag and while i was crocheting it reminded ​​me a bit of a fish tank, hence the fish. because i came yarn deficit for the melange (patchwork) blanket i bought some new, you guessed it, variegated yarn. you see it on the photo above, the smaller square. and also this time i cut it into pieces and made smaller balls​​. the container i also strengthened with the glue mixture. i wonder how you get inspired by your yarn, let me know in a comment if you like? that is it for this week, hope you will celebrate your weekend and it would be great to see you next week! Categories: crochet | Tags: bowl, crochet, yarn, yarn bowl, yarn leftovers | Permalink.